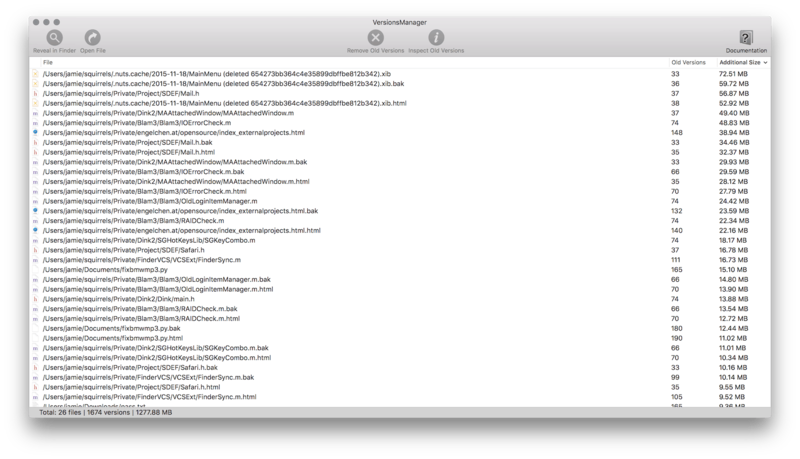 VersionsManager is an application that allows you to inspect and optionally delete old 'versions' of your documents that have been stored automatically by your Mac. Since Mac OS X 'Lion' 10.7, most Mac apps automatically store not only the latest version of any document, but all previous intermediate versions are stored too (see here). These previous versions can add up to many gigabytes of 'wasted' disk-space since it is common to have many hundred old versions for the files you have been working on. For most files you know that the latest version is 'good' and that you won't ever need access to previous versions anymore. Even if you do need an old version of a file, you can restore old versions if you have enabled the 'TimeMachine' backup-feature of macOS. Also, these old versions are useless as a back-up because they are stored on your main disk and are automatically deleted when you delete the corresponding file. 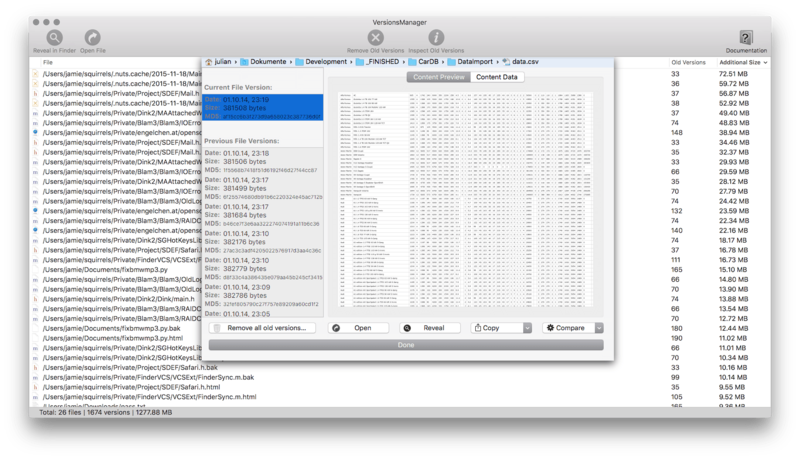 VersionsManager can display all files which also have additional 'old' versions stored. You can also inspect all old versions and compare them to see what has changed. If you are sure you do not need those old versions you can delete them individually or all at once. If you are are sure you don't need any old versions of your files you can even delete all old versions on you Mac at once, reclaiming gigabytes of space with a single mouse click. VersionsBrower licensed under a proprietary license and free of charge in its basic form. The functionality to delete old versions of your files is an in-app purchase costing 4.99$. Technical support is available only from within VersionsManager (in the "Help" menu).